Ok, so I love shiny. And I adore leggings. 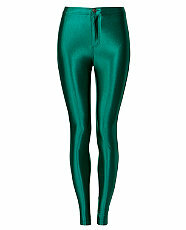 Therefore the trend for disco pants is pretty much right up my street. I have been hearing for a while about these but not paid too much attention as for some reason I had in my head that they were the sequinned hot pants and therefore old news. Now I’ve finally caught up and realised what they are, I can’t wait to purchase my first pair! Although they look as if they could be hard to pull off unless you are super skinny, I look at this in the same way as skinny jeans. They probably hold you in more, sucking in all the bits you aren’t too happy with and making you appear more, well, streamline. Plus the fact that they are high waisted is really flattering for tiny waists and hour glass figures. My favourite ones come in jewel colours rather than the usual black and the perfect partners for them are crop tops and baggier tops tucked in to the waistline.